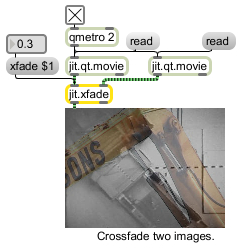 The jit.xfade object crossfades between two matrices. A crossfade value of 0 results in output values equivalent to the left input values, while a crossfade value of 1 results in output values equivalent to the right input matrix. xfade float The amount of crossfade between the two input matrices (default = 0.) A value of 0. outputs only the matrix received in the left input, and a value of 1. outputs only the matrix received in the right input.